Barry is determined to lose weight without going under the knife. Barry Austin admits he’s got a way to go before he achieves his New Year’s resolution for 2014; he’s aiming to become the world’s biggest loser by shedding 203kg – without resorting to surgery. When he began his weight loss challenge in late 2012, he weighed more than 317kg and is famous in his native UK as Britain’s Fattest Man. He’s been the subject of a film and countless interviews and news stories. He even had a magazine column devoted to his unhealthy eating habits and his views on food. But dubious fame came at a huge cost – for the past five years he has been largely housebound. He suffers a range of weight-related health problems including type 2 diabetes and trouble breathing. He regularly develops infected leg sores that render him bedbound. These are caused by his skin getting strained by the excess body fat. His weight also makes it dangerous for him to undergo a general anaesthetic, so an operation to reduce his fat is out of the question. But Barry, who weighed in at a staggering 349kg in early 2012 after bingeing on junk food when his mother Lillian died aged 80 of natural causes – she herself was almost 190kg – is now fighting back against the obesity that has cursed him all his adult life. In early 2013, he enlisted the help of a personal trainer who has also prescribed a diet for him. Now he wants to be the poster boy for dieting and wants his problems to act as a warning for others. Barry, 46, has a message of hope for people who feel they are stuck in a destructive pattern of binge eating. Barry has enlisted the help of his friends, filmmaker Jonny Banister who is making a documentary about the weight loss campaign, and old school friend and personal trainer Donville Hendrix. Together they call themselves Team Baz and plan to set up a project called Barry’s Fighting Fit, which will visit schools and health centres in the UK to talk about the issues around obesity. Barry admits that for much of his life he has been eating himself to death. He was a normal-sized child and enjoyed hearty home cooking such as meat stews and calorie-rich fried breakfasts. When Barry was younger, he worked as a cab driver and played rugby. It was his friends, he says, who encouraged him to enter eating and drinking competitions – and he always won. His huge appetite led to him becoming a local celebrity. And the older he got, the bigger he got and he became a minor celebrity as the fattest man in his hometown of Birmingham. As an avid football fan, he was adopted as an unofficial mascot by the former premiership league team he supports; Birmingham City. Opposition fans would habitually chant ‘who ate all the pies?’ at him and Barry would reply ‘I did’. For a while it was all a game. In his twenties and thirties Barry, who is 183cm tall, gorged on junk food – crisps, burgers, colas and fried chicken. He could consume a staggering 29,000 calories a day. The recommended intake for an adult male is no more than 2,500. 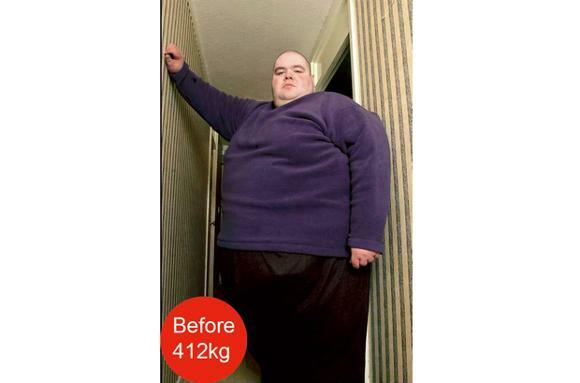 By the time Barry was in his 20s, he weighed a massive 413kg. His daily diet consisted of a breakfast of several cuts of fried meat, six to eight fried eggs, a huge helping of potatoes and a loaf of fried bread, a lunch of four portions of fish fried in batter served with chips and a dinner of nine adult curry portions, more than one kilo of rice cooked with ghee and several naan breads. Snacks included family sized cream puddings, up to 20 family sized bags of crisps and several chocolate bars. He washed all this down with 12 litres of fizzy drinks such as full-sugar colas and lemonade. At first he enjoyed the infamy of being crowned the fattest man in the UK. “At that age I thought it was fun and that I was indestructible. I thought my body could cope,” he says. In December 2009, Barry played Big Brian in ITV1’s comedy-drama The Fattest Man in Britain starring Timothy Spall and Bobby Ball. Barry eventually lost the title of Britain’s fattest man to Paul Mason, who was 444kg at his heaviest and was classified as the world’s heaviest man at the time. “People asked me if I was sad about losing my title,” says Barry. “I might have been when I was young but it was a curse and the only thing I was sad about was the fact that someone else was going through what I was going through. Nobody should have to suffer the way we do at our size. Barry decided to change his life after watching the Channel 4 documentary Britain’s Fattest Man, which followed 49-year-old Paul Mason’s battle with obesity. A fter several attempts to lose weight in the past, which saw him yo-yo between 412kg and 285kg, he began his campaign in earnest last April and has already gone from more than 317kg to around 285kg. It is difficult to get an accurate weight because he needs to be weighed on special scales. The nearest approximation he can get is to be weighed in a van at a local vehicle weighing station. Barry now has a personal trainer and works out three times a week. His health campaign is not without its logistical problems as he has to be driven to the gym in a minibus as he is too big to fit in a car. Barry has thousands of supporters on his weight loss facebook page and has asked restaurants and takeaways near his home to refuse him service in a bid to help him achieve his goal. “I want people to catch me if I go off course. I want people to stop me eating chips or curry,” he says. Barry is now engaged to his carer Debbie Kirby. The two first met at infant school, but then got separated and were sent to different secondary schools. It was 15 years ago that Debbie, single and a mother of four after splitting from her children’s father, was once again reunited with Barry and they started dating. Now Barry’s diet consists of muesli for breakfast, salad for lunch, lean meat sandwiches with chicken or beef and jacket potatoes for dinner. Snacks consist of small bread rolls with chicken and he has cut down to two litres of reduced-sugar cola a day. When he treats himself to a curry, he orders just one, which he shares with Debbie. He admits it is a struggle, particularly the gym sessions. Each time he stands up Barry has to hoist his 285kg frame. His fitness regime is modelled on the training sessions used by boxers Mike Tyson and Floyd Mayweather working out and being on a controlled diet. He uses punchbags and speedballs and spars in the ring, although he needs to sit on a specially made stool between bouts of exertion. “I didn’t so much as walk into the gym, I rolled in,” laughs Barry. “One man told me I was in the wrong place and that the curry restaurant was over the road. “To begin with I had to exercise sitting down. Now I can stand for a few minutes then I have to sit down for two or three minutes’ rest. I go to the gym three days a week for up to 90 minutes. Barry hopes that as well as extending his life and helping others, losing weight will allow him to enjoy life’s pleasures again. “My dream is to be able to go fishing and to drive,” he says. “I can only fit one leg in the footwell of the car at the moment.